It’s never easy to come to terms with the fact this “relationship” isn’t healthy. Break-ups can be ugly and messy because sometimes you’re holding onto the hope that things will change. Sometimes, though, they just don't! You’ve come to the fork in the road and you need to make the choice between the familiar path or the road undiscovered. I know you're itching to head down the same route you know too well again. You know when the potholes come so you expect the impact. I think what you need is a new destination, though. A chance to start fresh someplace better. Don't worry, I've taken care of the pros and cons. Read on and see if this helps you move on. All in, an open office plan can cost over $50,000 to fit out, according to Apex Executive Interiors "Fitout Cost Calculator". This price obviously varies depending on how much or how little you need. For a full, commercial office, you can expect your bill to reach almost $200,000. In total, prices for upkeep can reach almost $100,000 per year. I’m sure by now you’re getting the drift. Conventional offices are expensive. Why seek investment for hundreds of thousands of dollars that will all go to where you work, not the work itself? Let’s assess a typical small business. Since growth is in its beginning stages, you don’t need a fully fitted office. With choices of hot desks, dedicated desks and meeting room packages, anybody can successfully manage a business without paying for everything a traditional office requires. Why tell you about flexible workspaces? 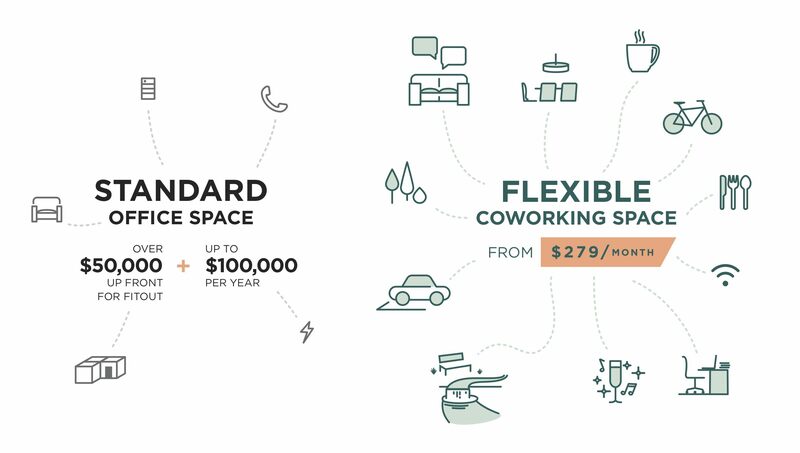 Flexible working starts at $279 per month, per person and the commitment is 6 months for hot desks and meeting rooms, while only 12 months for a dedicated desk. All starting at $279 per month. So, for the three-person commercial office we explored at the beginning, you’re looking at $837 per month for you and your employees, which adds up to just over $10,000 annually, while we take care of virtually everything else! What’s more, GONE are the days of driving an hour and a half through peak hour traffic to the city where you think you should be for your business to grow. Stay closer to home instead! Some 60% of employees and small business owners find that they’re more relaxed at home since moving into a coworking space and a big part of that is how close they are so their commute is cut in half or more! 70% of employees/small business owners felt healthier than they did in a traditional office space due to their ability to socialize and interact with like-minded individuals in an area with open floor plan, natural light and greenery. Lastly, once you’re a part of the community, you’ll see why so many big businesses like Microsoft are making the change to coworking spaces. You’ll also see how the centre grows with your business. Our serviced offices are also world class in quality and they’re within reach once you feel your business is ready to make that step up. The pathway exists and it’s easy. When’s the last time anything was easy?! What are we doing? Are we both truly happy? I feel like ever since we wrote that lease agreement…we don’t even talk anymore. You don’t join me for coffee. You never take me out. I don’t know, I just…I’ve found greener grass and…they mow it for me. They’re not always asking me for money then disappearing. Please accept this as my official notice of vacation.